Much colder-than-normal air has already infiltrated much of the northern US and soon it will extend to the east coast. This change to colder-than-normal conditions will stick around for awhile as a reinforcing shot of Arctic air will plunge southward into the Northern Plains by early next week and then spread eastward to the east seaboard on Tuesday night and Wednesday. In terms of precipitation, another soaking rain event is coming to the Mid-Atlantic region on Friday with the heaviest and steadiest rain likely to fall during the PM hours. Once this system passes by to the northeast of here late tomorrow night, winds will intensify and cold air will pour in from the northwest just in time for the weekend. A second storm is likely to pull out of the Gulf states early next week and produce more soaking rain here in the I-95 corridor on Monday night and Tuesday as it intensifies into a powerful system. This system will be followed by very strong - and potentially damaging - NW winds on Tuesday night and Wednesday and the influx of another very cold air mass for this time of year. After a dry and chilly day on Thursday in the Mid-Atlantic region, clouds will increase overnight and the next round of rain is likely to arrive by mid-day on Friday as low pressure pushes northeast from the southern US. The heaviest and steadiest rain with this next system is likely to come during the afternoon and evening hours in the DC-to-Philly-to-NYC corridor – a part of the country that is already very waterlogged. Once this system passes by to our northeast late tomorrow night, winds will intensify out of the NW and much colder air will pour into the region. High temperatures on both weekend days are likely to be confined to the 40’s in the I-95 corridor (normal high is now 59 degrees at PHL and 61 degrees at DCA) and winds will remain a noticeable factor on Saturday. Below-freezing temperatures are quite likely in much of the I-95 corridor for overnight lows by early Sunday morning and perhaps again early Monday morning. In terms of snowfall across the nation, with the cold air already in place, a few inches may fall today in parts of the Central Plains and then the Great Lakes region could see some rather heavy snowfall later tomorrow as the influx of cold air flows over the still relatively-warm lake waters. On Monday, copious amounts of moisture will make a move to the northeast from the Gulf of Mexico and rain is likely to return to the DC, Philly, NYC metro region sometime Monday night. As low pressure intensifies rapidly near the Mid-Atlantic coastline on Tuesday, the rain may become heavy at times which could very well renew localized flooding concerns as grounds are very well-saturated. Once this powerful storm passes by to our northeast late Tuesday, winds will pick up dramatically in strength from the NW - potentially reaching damaging levels - and a second shot of very cold air for this time of year will flood into the Mid-Atlantic region. The Great Lakes snow machine is likely to turn on again with this mid-week cold air outbreak and snow showers could even work their way into the immediate I-95 corridor late Tuesday night and Wednesday. Looking ahead, while this cold pattern is likely to stick around through much of next week for a good chunk of the nation, it is quite likely not the beginning of sustained winter cold here in the eastern US. 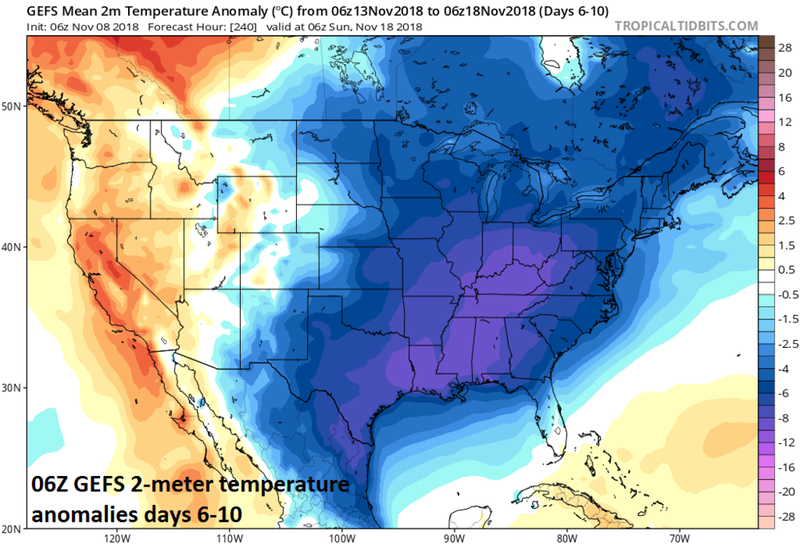 In fact, temperatures are likely to bounce back quite well during the week of Thanksgiving – giving us a nice break before the real winter cold locks into place.